mind to help you with relaxation, sleep, work or meditation. Type ‘Tesla Audio’ in Search today! 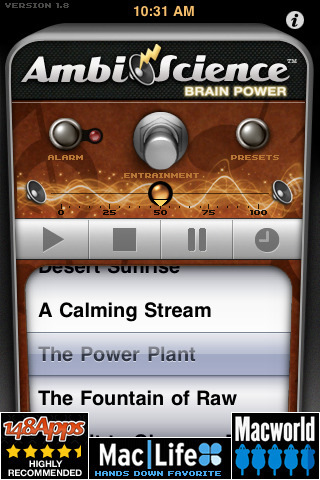 Binaural entrainment in ONE and with unparalleled ambient music. • Isochronic – headphones not required. • Binaural – requires headphones. — Full instructions in app. NOTE: If you experience performance issues (missing tracks, no sound etc), you may have gotten an ‘incomplete’ download and should re-install the app. NOTE: The iPhone/iPod speaker is not capable of producing all of the entrainment effects listed – best to use earbuds/headphones or external speakers.